US policy toward North Korea has reached a dead end. Built upon a foundation of dubious assumptions, the Obama administration’s approach—whether called “strategic patience” or by some other name—has failed to achieve any progress toward US objectives in the region and no longer serves US foreign policy and national security interests. During the administration’s time in office, the North’s nuclear and missile threat has expanded, the danger of periodic tensions and unintended escalation on the peninsula has grown and little or nothing has been accomplished in terms of effectively dealing with non-security challenges such as Pyongyang’s human rights violations. Moreover, the North has managed to improve its economy while at the same time moving forward with its nuclear and missile programs. In fact, by adopting a policy that in effect stands back from the fray, the United States has diminished its status as the arbiter of peace and security issues on the peninsula. While most experts in Washington agree that the current US policy has failed, there is little or no agreement on alternative approaches. Moreover, there appears to be scant chance that the Obama administration will alter course with less than a year left in office. Admittedly, dealing with Pyongyang is difficult under the best of circumstances, and the past seven years have proved particularly challenging. Developments since the leadership transition in Pyongyang and uncertainties about the North’s future, continuing nuclear and missile efforts (nuclear tests in 2009, 2013 and 2016 and space launches in 2009, 2012 and 2016) and the failure of the 2012 “leap day” deal all complicated matters. It is also true, if former campaign and other officials are to be believed, that, once briefed on the realities of the North Korean nuclear program, the incoming administration made a conscious decision even before these events that attempting to reach a diplomatic solution with the North would be politically unwise given the risks of failure. Add to this witches’ brew the donnybrook in Washington over the Iran nuclear deal, and any renewed effort to formulate a new initiative toward the North seems more than unlikely. This paper explores the failures of current US policy toward North Korea, the threats and challenges posed by North Korea and developments that may help persuade the next US administration to adopt a new approach. 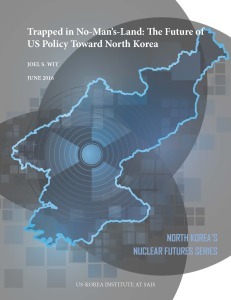 Download the report, “Trapped in No-Man’s-Land: The Future of US Policy Toward North Korea” by Joel S. Wit.